Flying out of the water at high speeds is a sure way to hurt something - or someone. No matter how carefully you plan, how cautious you are, or how fast your boat is, sooner or later you’ll get caught in rough seas. And how you handle your boat – your seamanship skills – will make the difference between getting home safely, taking a beating, and maybe worse. Here are some boat-handling tactics that are good for getting back to the dock in one piece. Flying out of the water at high speeds is a sure way to hurt something – or someone. The golden rule: slow down. If your boat is launching off of the waves, something or someone is about to get hurt. Rule number two: play with the boat’s trim. There is no one “correct” trim setting for any boat, because it will change with conditions, load, direction of the seas, and other factors. Set the trim where you think it belongs to get the best ride, and then start playing. Go up a bit, then back to your staring point, then go down a bit. Until you try different settings, you won’t know which is best on any given day. Rule number three: alter course if necessary. None of us want to prolong the misery of a rough ride by heading off-course, but when you’re taking a real beating, it may be worth doing. But do so wisely; consider where land is, and the lee. Make adjustments that not only get you closer to home, but also get you into calmer areas. Rule number four: adjust your load. Something as simple as asking your passenger or passengers to switch which side of the boat they’re sitting on can have a dramatic effect in a small boat. 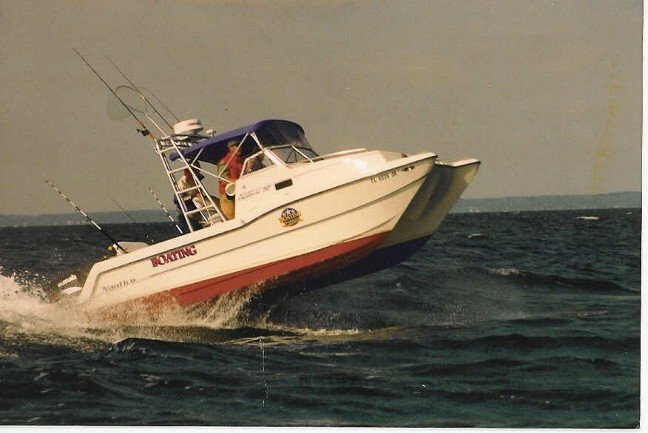 Moving them, or something like a cooler full of fish, fore and aft can also change the way your boat handles the waves. Rule number five: wait it out, when it makes sense to do so. In certain cases (like a sudden thunder storm or a front pushing through) you may be faced with a period of violent seas, followed by another calm. In these situations it’s better to point the bow into the waves and idle forward at a slow speed, rather than to try running through the nasty.